This is the summary of my work done in 2008. We developed a code to make three dimensional movies of the solar corona based on IDL (Interactive Data Language). 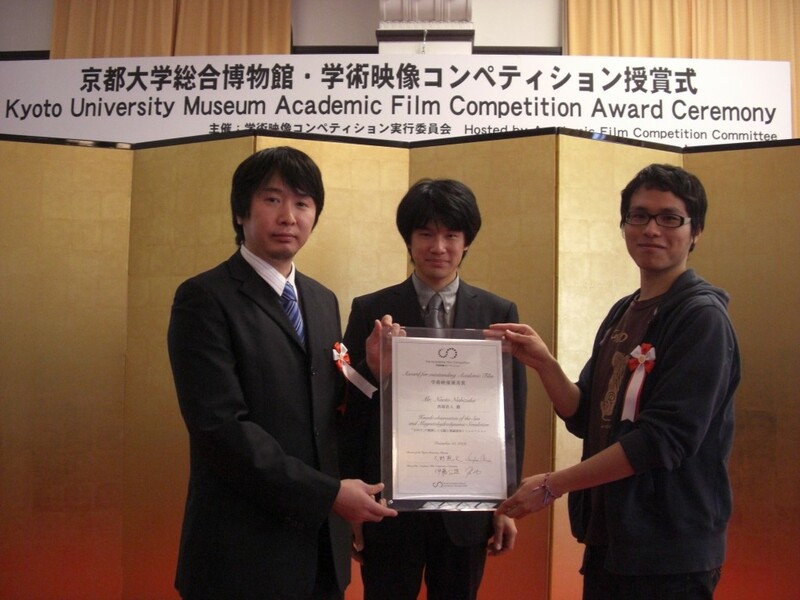 We were awarded for making useful movies in Kyoto University Museum Academic Film Competition 2009. Here we report a method to map the 3D structure of the corona, using complete soft X-ray images of the Sun taken with Yohkoh/SXT and Hinode/XRT. Our method utilizes two of these images which were taken 7 hours apart, with the assumption that the coronal structure does not change much during this time. This assumption is satisfied for the global coronal structure such as large scale coronal loops in active regions and quiet Sun as well as coronal hole structure. Using this method, we made 3D movies of the corona observed by Yohkoh and Hinode. With this movie, we can see the 3D structure and associated dynamical activity of the Sun more intuitively. the advantage of our method is we can create a 3D movie using only the data of a single satellite. First of all, we need the observed center-fixed and axis-fixed images (here, we do not take B-angle into account). Center correction (left) and axis correction (right). B-angle is not taken into account. Lining up these images after the corrections, we can make a solar movie. The difficulty is that these prepared images are not all taken at ￼￼￼￼￼￼￼￼￼￼￼￼￼￼￼￼￼￼￼￼￼the same interval, so the movie will not be smooth. an example of the observation time and the corresponding cumulative distribution of file number. As you can see, time interval depends on the observation date. Then we have to select the images, lining them up at approximately the same interval. Here, we used 30 minutes as the time interval and, selected the data as shown below. An example of the selection. Vertical axis indicates the cumulative file number, and the corresponding observation time is indicated by the horizontal axis. we finally could get the images line up in approximately the same interval (here, 30 minutes). These images, however, do not have the exact same interval. Therefore, for the purpose of interpolation, we utilized 14 images, 7 images before and 7 images after, around the selected images. We merge these 14 images and made the images line up at exactly 30 minute intervals. To avoid this inaccuracy, we made two modification. 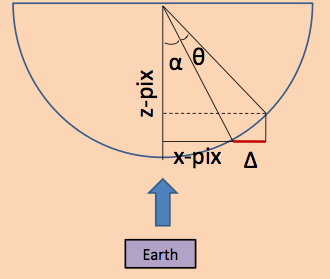 (a)Rotating the solar image according to how long between the time the image was taken and the time of the image we need to correct. To rotate the images, we calculated how many pixels the solar image must be moved to create an image at the correct time (indicated as Δ in the figure). The value Δ can be calculated in the expression below. This time, we utilized the rigid body rotation model rotating in 27.5 days. We can also take the differential rotation of the solar corona into account, and both models seem to have no apparent difference. The example of how the solar images are rotated using this modification. (b) Adding a weight, namely utilizing data that is closer to the time we want to make the image more than data that is farther away. the images were taken. Then we do not have to worry about the inaccuracy that arises from the difference in observation time during taking 14 images. An examples of the weight. Finally we can get the images lining up at exactly 30 minute intervals, and make a smooth movie. 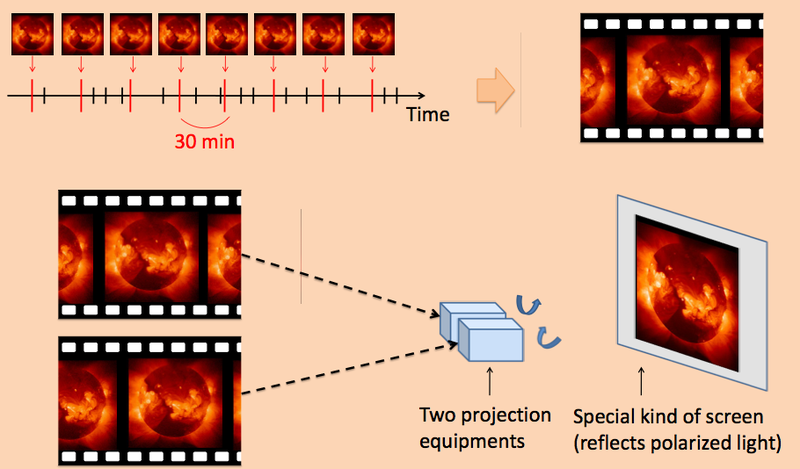 Then showing two movies with a several hour separation can be used in three dimensional visualization system, by using two projectors simultaneously.